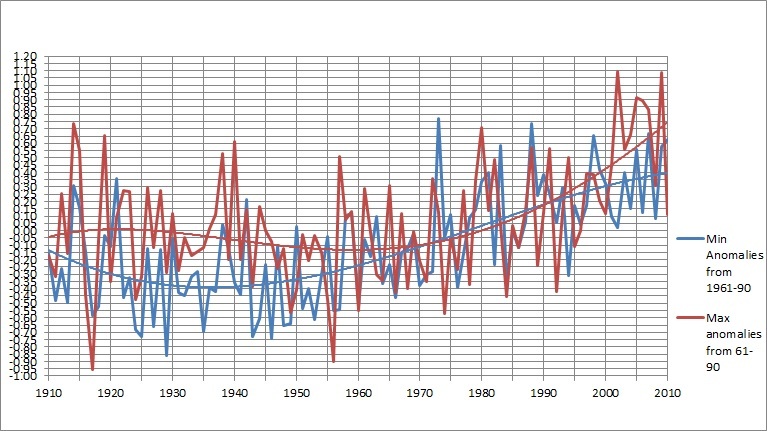 In March 2011 I analysed trends in Australian Maximum Temperatures from 1910-2010, and now I am following up with Minima. 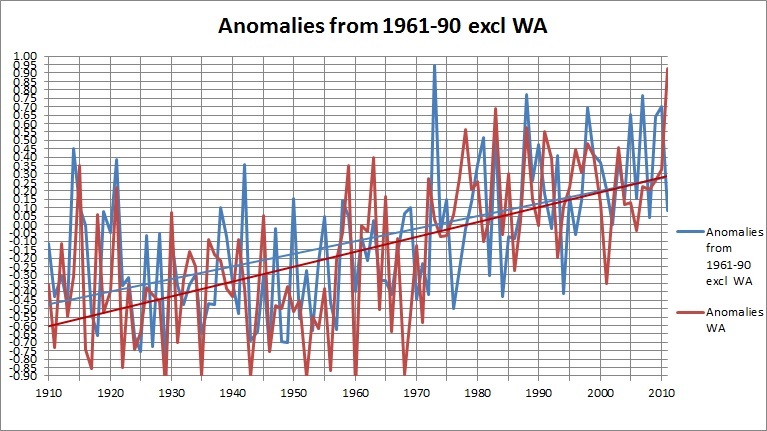 Since that time I have looked at adjustments made by the Bureau of Meteorology (BOM) and in a paper co-written by Dr David Stockwell proposed an alternative network of climate sites we call the Minimally Adjusted Network (MAN). This network comprises sites included in BOM’s High Quality (HQ) network but makes adjustments by comparison of overlapping raw data only. I have further revised this network by removing all sites where there is less than two years of overlapping data, where there is less than 80 years of data, where the record shows spurious data, or where metadata supplied by BOM indicates serious problems. I have deliberately included all urban sites including all capital cities except Darwin, usually at a nearby airport. The MAN dataset for Minima now comprises 89 sites. No assumptions are made about the data, and no subjective decisions are made about whether to adjust and by how much, unlike the adjustments used in BOM’s HQ datasets. No other adjustments are made. If a site meets the criteria but the metadata indicates serious problems (e.g. Nhill) or the data appears to be spurious (e.g. Halls Creek), it is excluded. As more metadata becomes available it may be that further sites will be excluded. 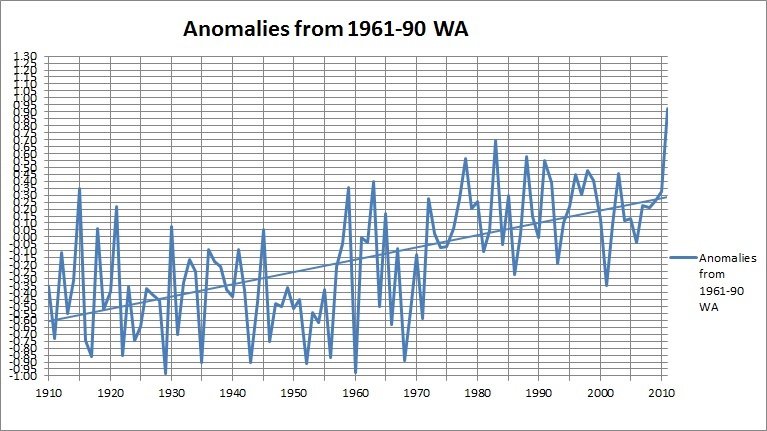 To compare temperature across Australia I convert all data to anomalies from the 1961 to 1990 mean for each site. I then calculate the mean anomaly for each year for a selection of sites. While I show data from 1910 to 2011, much 2011 data has still not been “quality assured”, so many annual means were not available. For these sites I found the annual mean from the daily means, which is not the correct method, but is close. Caveat: There is considerable uncertainty in all temperature data. BOM says that Automatic Weather Station (AWS) data has an accuracy of +/- 0.3C. Celsius thermometers (mercury in glass) have an accuracy of at best +/- 0.5C. Fahrenheit thermometers, certainly no more accurate, were used before September 1972 and temperatures recorded before then were converted to Celsius for modern comparison. The records show that in the Fahrenheit era, many observers used whole degrees even though BOM’s instructions to observers were to record temperature in tenths of a degree. That’s hard enough on a Celsius max/min thermometer. A number of quite recent observations appear to be recorded in whole degrees. 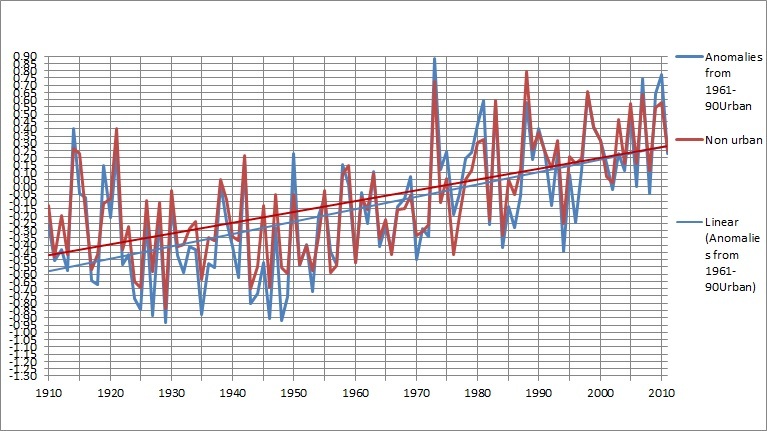 The change to Celsius in 1972 may have led to an artificial warming relative to pre 1972. Certainly the Australian temperature record must be treated with great caution. Therefore my figures are subject to the same uncertainty. 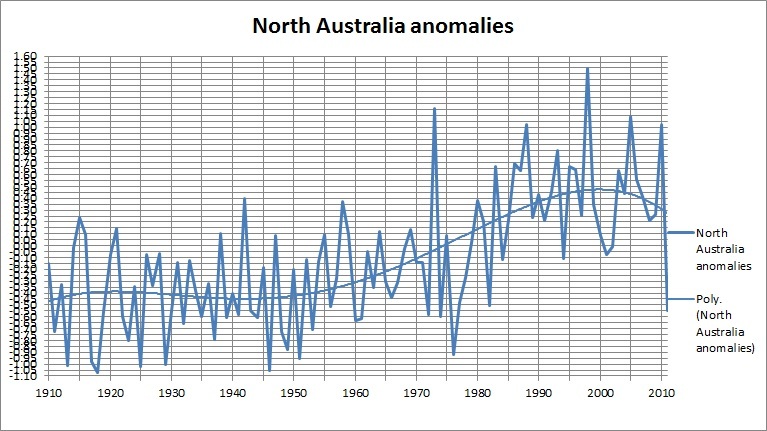 While Australian temperatures have been rising, it has been by no means a steady increase. There was an enormous jump up in the 1970s. The 4th order polynomial trend line shows the distinct fall and rise. Are we following a natural cycle? The next few years will be decisive. Wildly different! It’s worth putting both together to show the difference more clearly. WA is clearly a different climate zone. Not such a great difference. Urban sites are warming slightly faster- UHI?- cooler up to 1950s, and in the 1990s, and are a little more variable, which is surprising. Sites within 100km of the coast have much less variability than inland sites, due to the oceanic influence. 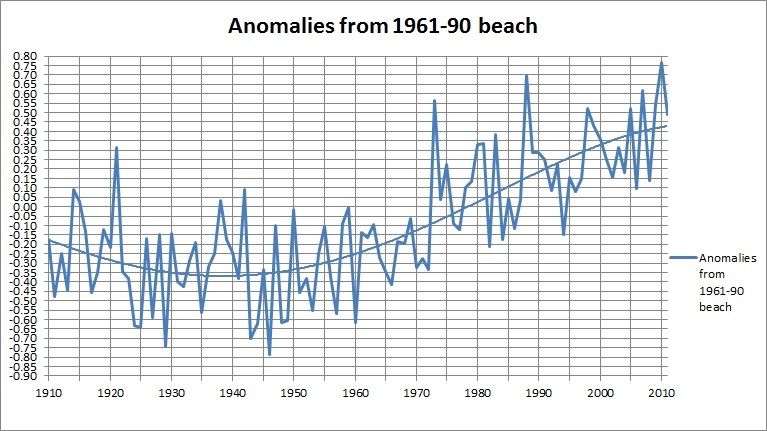 Inland sites have greater extremes, but the overall trends are very similar, except that coastal sites are getting warmer, whereas inland sites’ extreme peaks have been decreasing since 1973. The extremes are at identical times, but the standout differences are 1973, 1976, and of course 2011. Note the late 1970s step up is very clear. Note that northern minima- further from the South Pole- are warming faster than the southern. The north has much greater extremes and appears to have peaked. I have plotted Maxima and Minima only to 2010. 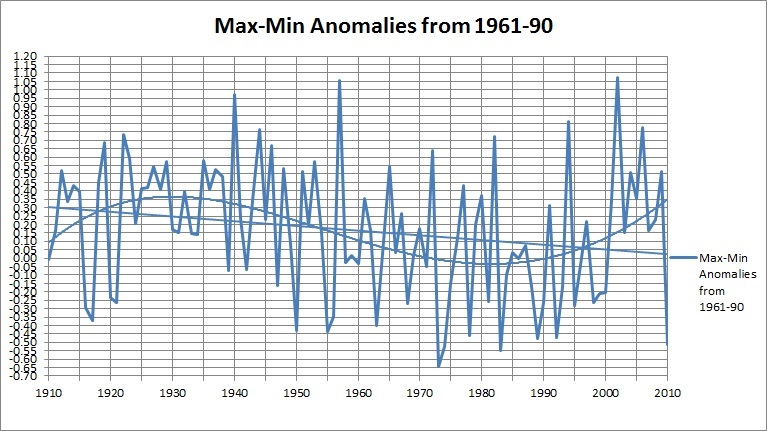 While the linear trend for Minima is greater than for Maxima, and after initially decreasing, Minima anomalies have been rising since the 1940s, in the past decade (“the hottest on record”), minima have flattened. The record means have been caused by much higher maxima. This is especially visible in a plot of the annual Max-Min range, which shows the linear trend steadily decreasing as is expected with the Greenhouse Effect. However, the range has increased steeply since the 1980s which is not what is expected. 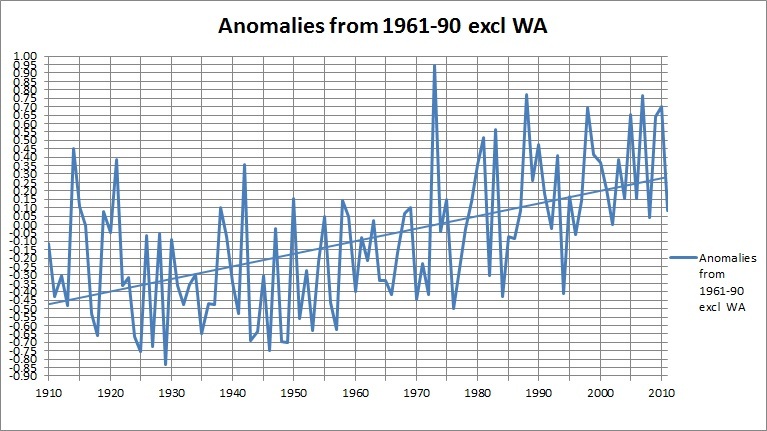 This is not the signature of Anthropogenic Global Warming, at least in Australia. The Minimally Adjusted Network provides an alternative network of 89 long term sites with few adjustments to the raw data. 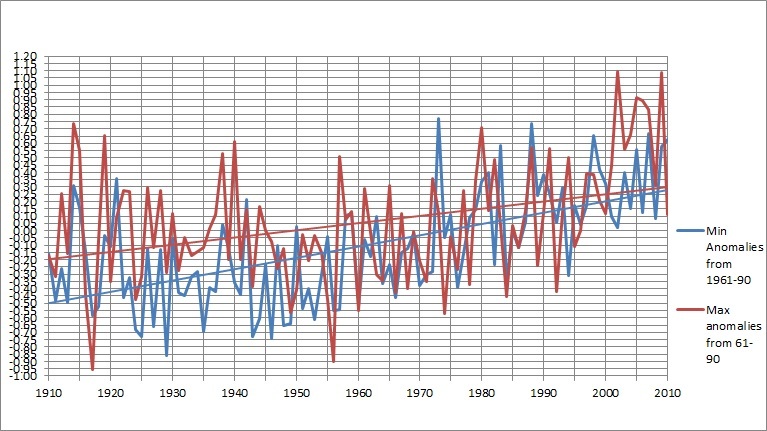 Uncertainties in the data accuracy of at least +/- 0.3C mean that the temperature record must be viewed cautiously. There is little difference between Urban and Non-Urban minima. Western Australia has a completely different climate to the rest of Australia. 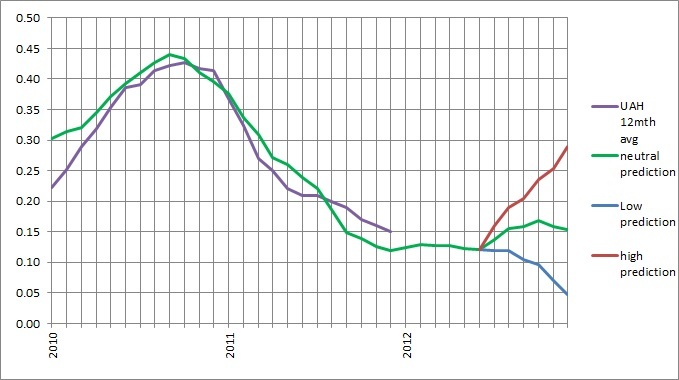 Coastal and Inland trends are not greatly different, except for variability, until 2011. Much can be learned from looking at Means, but an analysis of Minima yields further interesting information. Remember: Anthropogenic Global Warming due largely to the greenhouse effect should be visible in Minima. Temperature increase should be greater at night, in winter, and towards the poles. It is plain, however, that in Australia this is not the case. 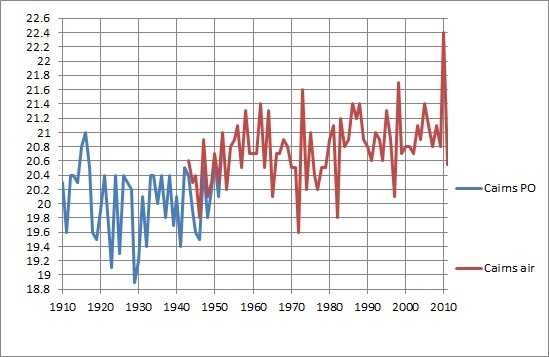 Since the 1940s, very cold years have been getting progressively milder, but since 1973 very mild years have been getting progressively cooler. 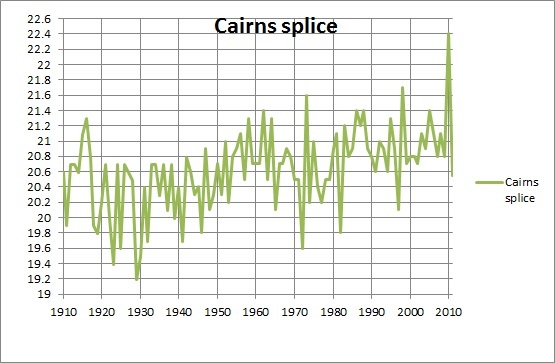 Further, the increase in minima is more pronounced in northern Australia than in the south- and while southern Australian minima have been steadily increasing, northern minima have a much greater variation and appear to be now decreasing. The Range bewteen Maxima and Minima does not show the greenhouse Effect signal. My guess is that El Nino/ La Nina conditions have a very large influence on northern Australian (largely Queensland) minima and consequently Australian minima. The huge variations we see from the 1970s to about 2000 have decreased. The huge step up of the 1970s (The Great Climate Shift) is clearly visible in the minima, but the next few years will show if it has run its course. I expect it has. 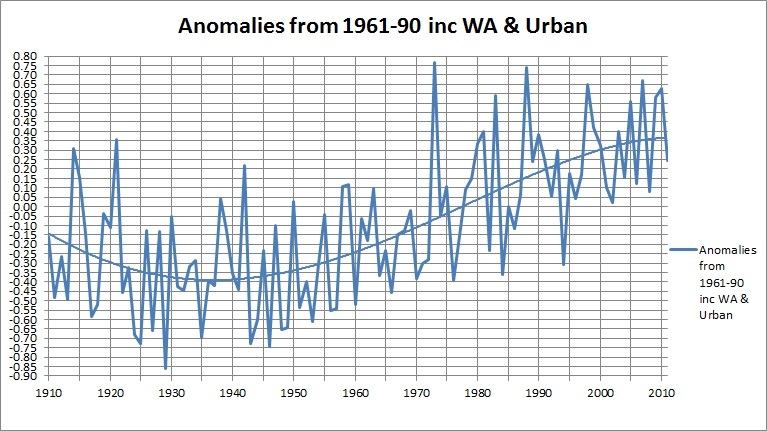 And finally, 2011 was not particularly unusual- except in inland and northern Australia where it was the coldest since 1994. This page will be reposted around the middle of February, as soon as SOI and UAH data for the previous month are available. The December UAH value is +0.13 making the running 12 month mean +0.15 +/- 0.1. December SOI reached 23. So we’ll see how we go this year! Last month I tipped “the next major enhancement to weather with heavier rainfall should be in the last week of December to mid January”. Two cyclones appeared and caused major flooding in the Northern Territory, plus a Christmas Day storm in Melbourne (probably not connected!) and heavy storms about the Queensland Central Coast, so a little earlier than I expected but not much. Although there are extremes about right now (12 January) I expect the next major build up of heavy rain and possibly cyclones off the east coast around 22 January to mid February. This is the usual time for the arrival of the Wet season in this part of Queensland- when school starts. So here’s my plot of what global temperatures could be like over the next 11 years, excluding major volcanic eruptions or other unforseen factors. These represent my long range predictions for 12 month running mean global tropospheric temperatures as recorded by UAH. 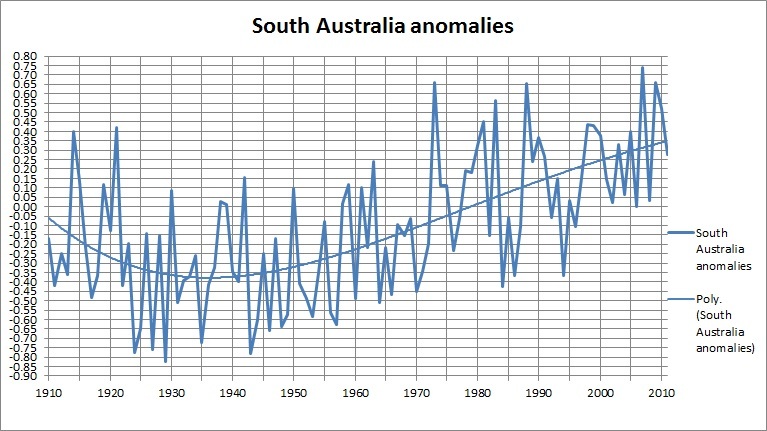 This is based on my analysis of the UAH record compared with the 120 month running mean of the Southern Oscillation Index with a lag of 11 years and the 12 month running mean of the SOI with a lag of 6 months. The upper and lower limits are for the maximum and minimum historical values for the 12 month mean SOI (+23 and -23). If the global 12 month means exceed either of the black lines for more than 2 years I would consider this prediction falsified. FF = fine-tuning factor, which for long term purposes can be assumed to be +/- 0.1. Here is a plot of the calculated means vs actual UAH 12 month means since 1979. Note there is great variability. Far from falsifying my hypothesis, I consider that this clearly shows the effect of volcanic eruptions. 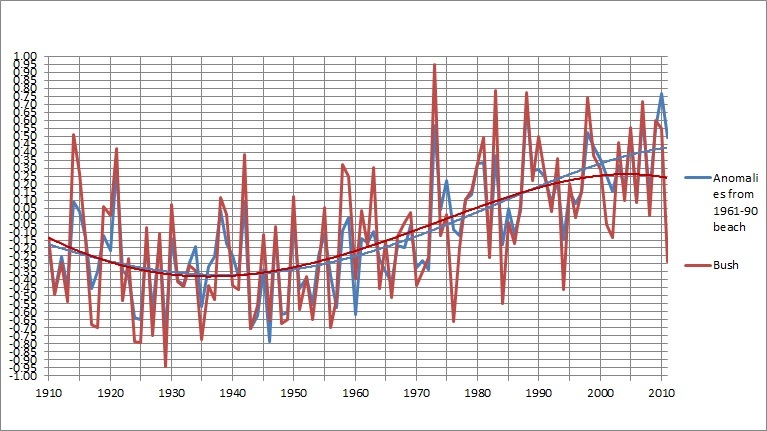 The correlation between my calculated and actual values for 12 month mean UAH from January 1998 (the year of the big El Nino) to December 2011 is 0.7348, and from 1979-2011 is 0.6898. I also include graphs showing the contribution of various factors. 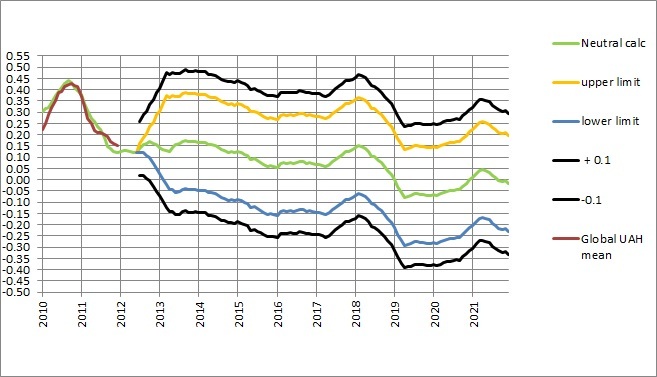 12 month running mean of SOI values is obviously related to UAH, but other factors are involved. Running 120 month mean of SOI since 1876- note the big jump since 1976. What if we advanced it by 11 years and combined it with the 12 month mean. 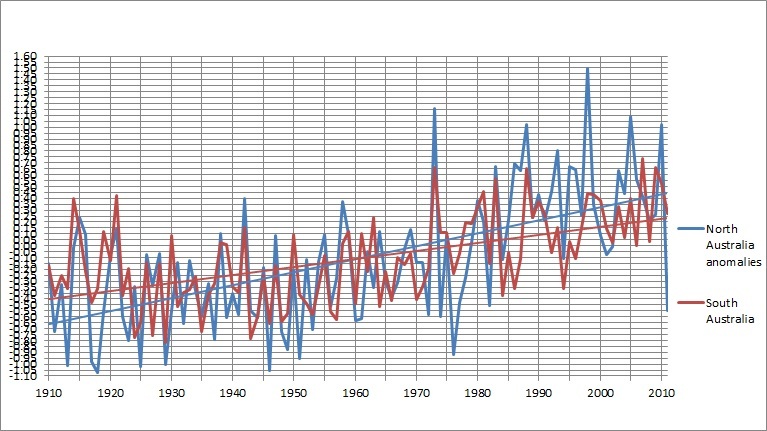 Here’s the calculated values 1979-2011. I expect that I will need to rework my calculations in the light of future data. In particular, I’m sure that the long term values have varying influence which is why there is variation. These are still early days. You are currently browsing the kenskingdom blog archives for January, 2012.